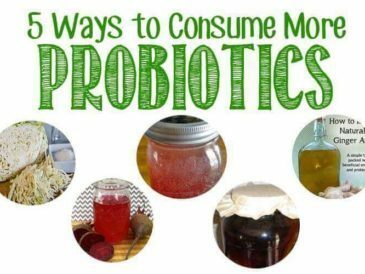 I’ve written before about water kefir, and it is definitely my husband’s favorite way to get probiotics naturally. It doesn’t have the strong taste of kombucha and is faster to make. Where to Get Water Kefir Grains? 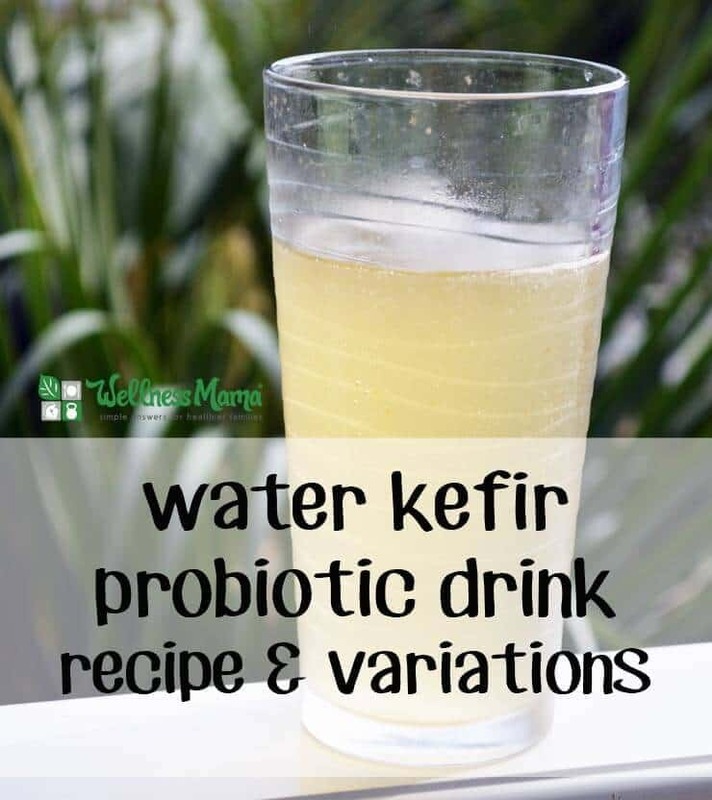 If you’ve never made water kefir, it is really simple to make. I get live water kefir culture (called grains) from here and use them to make endless batches of water kefir. One small batch of water kefir grains can make hundreds of batches of water kefir and multiply itself if properly cared for. Follow the instructions through step 6 for basic water kefir. Follow the rest of the steps to restart the water kefir making cycle and to flavor and carbonate your water kefir. ¼ cup sugar per quart of water. Do not use honey. In a half gallon size glass jar, dissolve the sugar in small amount of hot water. If you plan on making the full half gallon you will need ½ cup of sugar. If you are only filling the jar halfway then you only need ¼ cup of sugar. When sugar is dissolved, fill the rest of the jar with cool filtered water and make sure the water is not warm. It must be at room temperature! Add the hydrated water kefir grains. Cover with towel, cheesecloth, or coffee filter and rubber band to keep out insects or small children. 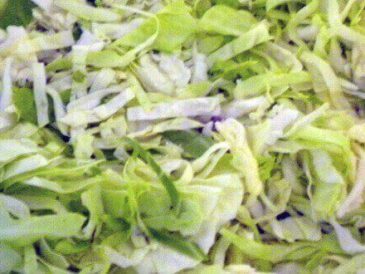 Leave on the counter (preferably at 70-75°F) for 24-48 hours. After 48 hours, strain the water kefir grains through a bamboo or non-metal mesh strainer pouring the liquid into another container. I use a half gallon jar for the first process then strain into two quart size jars. Restart the process by dissolving more sugar in water, adding cool water, and adding the same water kefir grains. 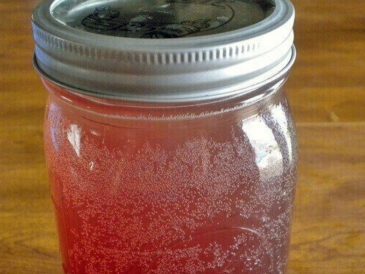 To make the water kefir carbonated, pour a couple ounces of fruit juice such as grape, pomegranate, apple, or cherry into the water kefir you just strained. I don't recommend citrus for this part, as it makes stringy yeast-like things that are not tasty! 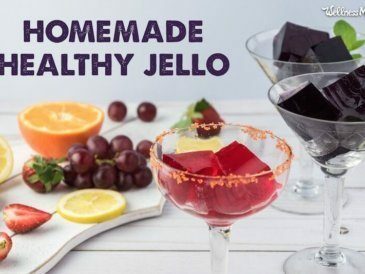 Once you've added the juice, cover the jars tightly with an airtight lid and leave on the counter an additional 1-3 days before drinking or refrigerating. 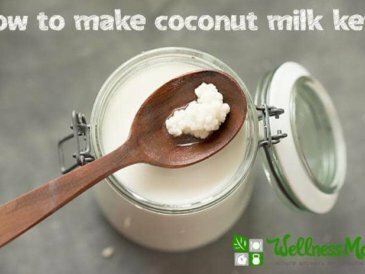 The longer you let your kefir ferment, the more sugar ferments out. So if you're limiting carbs, I recommend fermenting for the full 48 hours. Don't leave it longer than that though or it can starve the grains, which need sugar to live! For flavors, I recommend using a secondary ferment. After making the water kefir with the instructions above through step 6, I remove the kefir grains and use them to create a new batch as described above. I then transfer the newly made water kefir to a quart size jar and add in any of the ingredients below. Then, I cap the new jar tightly and leave to ferment for 2-3 days on the counter. This allows it to develop a natural carbonation. 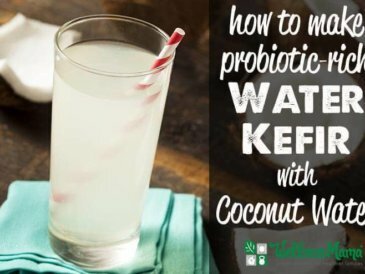 Do you make water kefir? What is your favorite variation?